Frame It All - Simple Modular Gardens. The gardens that grow with you. The Two Inch Series 10.5ft.dia x 5.5in. x 2in. 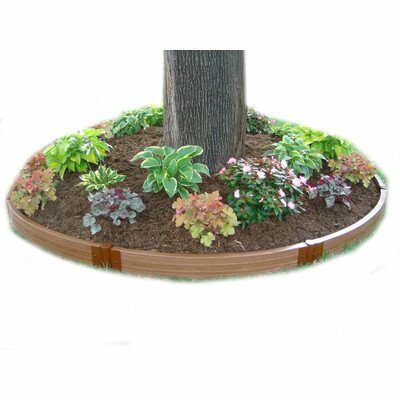 Composite Tree Ring Kit makes it simple for you to define your landscape with our revolutionary curved composite timbers for those who want to 'think outside the box'. Edging provides a professional finish to your landscaping investment and adds value to your home. Designed with the flexibility to be used as self-contained borders or as modules that can be connected together to achieve any border length or shape. Bold 2in. profile timbers create more perceived value for your landscaping investment. timbers are made from recycled plastic and natural fibers. No toxic chemicals. Allows endless design options. You can add on or reconfigure your raised garden bed at any time using existing or additional Two Inch Series Frame It All components and accessories.